Albuquerque Beer Scene: What's Next? Farm Raised Malt Liquor? Whole Foods, purveyors of expensive organic produce and meats and the source of the joke that everyone has heard but keeps getting repeated as if it were as fresh as the produce, "My friends call Whole Foods "Whole Paycheck! Hahaha!" ", now have their own line of inexpensive Premium style beer. Copper Bell Lager and Light Lager are the latest of the Whole Foods private label beers, with Lamar. St. (made by Goose Island) being the former. 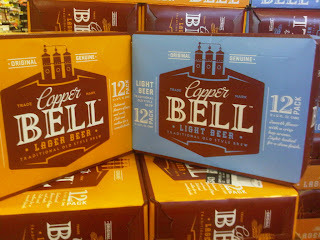 Sourced from a company that owns the names of over 30 different beer brands, including Wingwalker (Albertsons) and Big Flats 1901 (Walgreens), Copper Bell is contract brewed by the Genesee Brewery out of New York. The Lager is 4.5% ABV and the Light Lager is 3.9% ABV. Both are available in 12-packs at local Whole Foods (Whole Paycheck! Hahaha!) for $7.99.